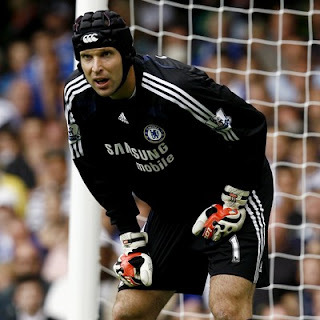 This guy is Petr Cech of the Czech Republic currently playing for Chelsea FC and here's some facts about this guy. He set up a new record by not conceiving a goal for 871 minutes in the 2004/05 Premiership game that beat Peter Schmeichal's record. But he had a much longer record of 928 minutes unbeaten at Sparta Prague. But his career had been threatened when he had a head injury caused by a collision with Reading FC's Stephen Hunt during the early minutes of the game in October 2006, the injury caused him 3 months out of play. Petr Cech probably is one of the best goalkeeper in the world.